Here’s some cupcakes that have peanut butter in the center. Yum! To make the filling: Combine the confectioners’ sugar, peanut butter, butter and vanilla extract in a bowl. Beat with an electric mixer on medium speed until well combined. Roll the mixture into 1-inch balls (approximately 24) and set aside on a baking sheet. To make the cake batter: Combine the flour, cocoa powder, baking soda and salt in a medium bowl; whisk together and set aside. In a liquid measuring cup, stir together the sour cream, milk and vanilla extract. In the bowl of an electric mixer combine the butter and sugar, and beat on medium-high speed until light and fluffy, about 2 minutes. Beat in the eggs one at a time, scraping down the bowl as needed. With the mixer on low-speed, alternately add the dry ingredients and the sour cream mixture, beginning and ending with the dry ingredients. Mix just until incorporated. Spoon a tablespoon or two of batter into the bottom of each cupcake liner. Place a ball of the peanut butter filling in each cupcake well. Top with the remaining batter so that all the cups are filled. Bake for 18-22 minutes, or until a toothpick inserted in the center comes out almost clean. Allow to cool in the pan for 5-10 minutes, then transfer to a wire rack to cool completely. 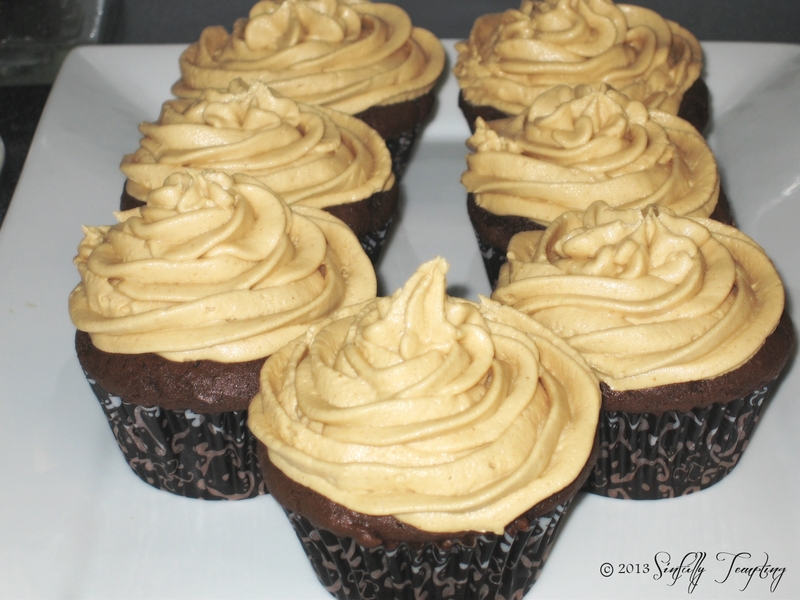 When the cupcakes are completely cool, top with peanut butter icing. Place the confectioners’ sugar, peanut butter, butter, vanilla, and salt in the bowl of an electric mixer fitted with a paddle attachment. Mix on medium-low speed until creamy, scraping down the bowl with a rubber spatula as you work. Add the cream and beat on high-speed until the mixture is light and smooth, approximately 5 minutes.